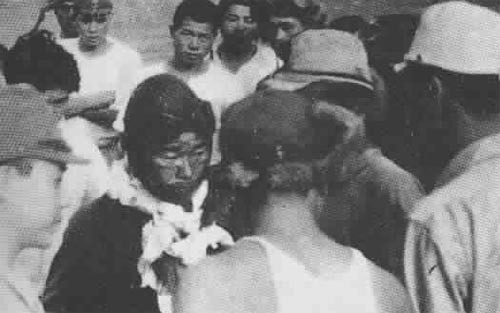 Saburo Sakai after his long-range mission to Guadalcanal of August 7, 1942. He received shrapnel wounds and lost his eye. Pacific: Sub.-Lt. Saburo Sakai, one-eyed Zero ‘ace’ (64 victories), shoots down B-29 Superfortress near Tokyo (night August 13-14). Germany: French troops deployed in West Berlin. Mongolia declares war on Japan.